Spinach Bacon Salad is a great side dish or a simple lunch or dinner. When it comes to dinner do you struggle with side dishes as much as I do? Yes, I am a food blogger that is totally admitting that I struggle with meals and food sometimes. I am supposed to be an expert. I am supposed to have it all together. My meals should always look Pinterest or magazine perfect. Right? Wrong. I am just like all of you. There are some days that I struggle to get meals on the table. There are some days that my family doesn’t love what I serve. There are days that my meals don’t have a side dish or vegetable. There are many days where my meals aren’t picture worthy. That is life and that is the reality for must of us. But side dishes and vegetables are good. They help stretch the main part of the meal, which is often the expensive meat part. They are healthy and filling. They add something to the meal that just makes it better. Yet, we often neglect side dishes and vegetables. The best thing you can do when it comes to side dishes is to keep it simple. Don’t make it complicated. Use basic ingredients that are easy to keep on hand. 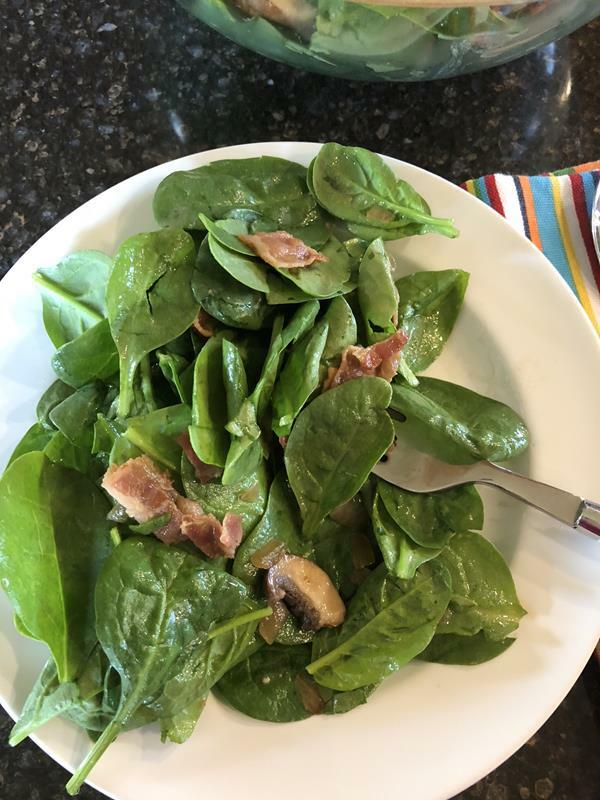 Recipes like this Spinach Bacon Salad. This spinach bacon salad is a side dish that goes with just about any meal. The ingredients are basic. And even non spinach lovers will like this one. 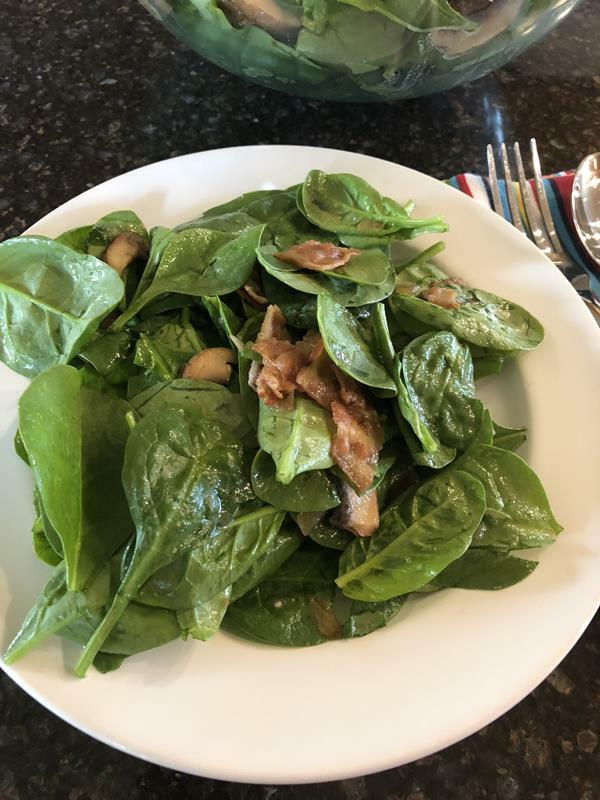 Here is where I admit that I don’t love spinach…It is okay, but it is not high on my list of favorite vegetables. My husband and two of my kids love it though. They love it cooked. They love it in foods. And they love it fresh in salads. A delicious side dish or a simple lunch or dinner. In a skillet cook bacon until done. Remove from pan reserving 2 tablespoons bacon grease for dressing and 2 tablespoons or so for cooking onion and mushrooms. Cook onion and mushrooms in 2 tablespoons bacon grease until onions and mushrooms are tender. Or until desired doneness. In a small bowl whisk together remaining two tablespoons bacon grease, red wine vinegar, mustard, and salt. 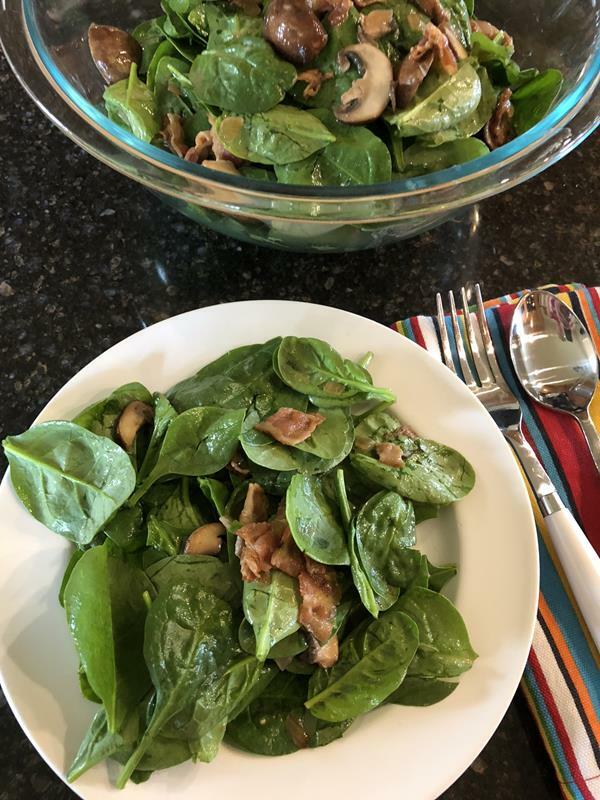 In a large bowl combine spinach, onion mushroom mixture, and dressing. Carefully stir just until well combined.